Life is all about choices, some turn out well and others can fire a whole load of challenges your way. The same is true as we develop our agricultural businesses from dipping a toe in the water to a new enterprise, or financially committing time, money and energy to turn opportunity into something more tangible. 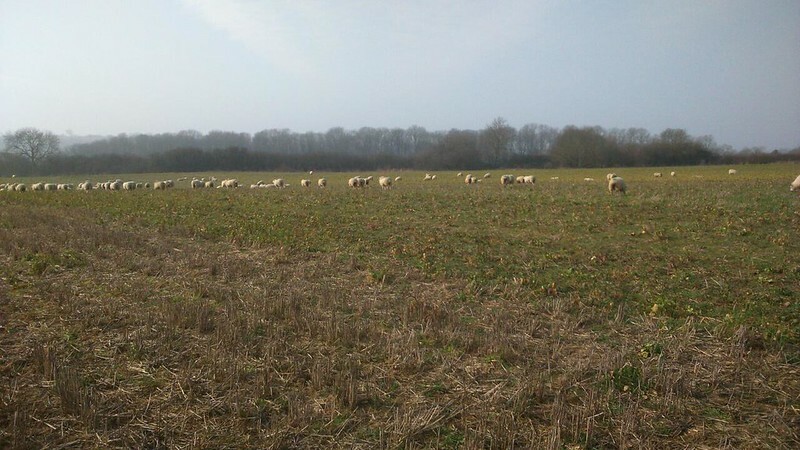 Over the last 5 or so years, many growers have either read about, dabbled with, or fully integrated cover crops into their arable and livestock businesses. We’re all aware of the soil health benefits of organic matter, storing nutrients, reducing erosion and helping structuring soil. However, cover crops do present challenges which can trip up or turn growers away from such an agroecological approach. Firstly, cover crops are part of my drive to improve the resilience of the soils during wet and dry periods of weather. They are part of a system in which I am trying to disturb the soil as little as possible, keep as much of my soil as possible armoured against the wind, rain and sun, and it’s based on an ever-expanding rotation. With such a philosophy, on my heavy Leicestershire soils, drainage is key. If you are going to pursue reduced cultivations, you have to make sure your land drains well. This is certainly an area I need to improve upon. Soil needs its mineral and water components, but air allows the soil to breathe and its fauna and flora to flourish. There are many other factors which influence this holistic picture and they all meet together like the ‘hustle and bustle’ of a busy crossroad. So from one direction comes my rotation and cultivation strategy, from another route come my fertiliser and plant protection options. The course I eventually end up having to travel upon is one that will have to be financially viable; no matter how attractive the ideology sounds. So at this congested junction sits cover, catch, and companion cropping. Much of the other paths are not new to me, but continuous cover is gathering momentum and maximising the benefits, whilst minimising the negatives is paramount. I have to choose crops that will not encourage too many pest and diseases (encouraging none is virtually impossible!). I want to establish them with as little compaction as possible so I choose to put them in with a seeder unit attached to my low disturbance sub-soiler and not roll them afterwards, relying on the subsoiler’s packer. Oats, phacelia with only a smattering of oil radish works well. Vetches can be expensive and air seeder fans are often not robust enough to blow them through the air seeder distribution head. I can grow crops which are not frost-tolerant (buckwheat and mustard) that might negate my need to spray them off, but my un-friendly blackgrass community continues to vie for my attention and the sprayer beckons. Topping, ploughing and grazing are all alternatives. Some of these destruction methods require lots of diesel and horsepower and can undo much of the structuring work I’m aiming for. Sheep would be my four-legged animal of choice, if glyphosate is not part of your system. Establishing the following crop raises another conundrum… Many growers like to spray crops off early in the year, allowing the biomass to collapse which ultimately leads to better drilling conditions. I struggle to consistently find a weather window in early January but they are about! Doing this keeps the soil cover but I think it reduces any allelopathy effect on following crops. The drilling operation is performed by my 4m Dale Eco-drill and, depending on conditions, I usually roll. I always start the first day of spring drilling mid-morning when the dew has abated, otherwise it can be a frustrating few hours getting the drill and the operator to deal with fresh, wet, cover crops. It always goes better on day two - whatever time I venture out of the farmhouse. My biggest challenges are blackgrass and slugs, so growing cover crops before spring crops is good, and reducing the brassica content helps fight the pesky molluscs. I’m told carabid beetles have an appetite for field slugs, so I’m investigating beetle habitat next. So there are a lot of choices to be made at this crossroads, my only bit of advice is take one of the pathways and don’t let indecision get you down. If it goes wrong, learn from it and move on, if it goes right…. get down the pub and tell everyone about it! Phil Jarvis has worked at the Allerton Project for 25 years, arriving as a working farm manager in 1992. He is currently Head of Farming at the project and also has roles on the NFU Environment Forum and National Crops Board. His interest in agriculture stemmed from working as harvest help on a farm in Norfolk whilst still at school. Since then he has been fruit picking in New Zealand, spent time on a maize and tobacco farm in Zimbabwe and a mixed contracting business in West Sussex. He has appeared in the Guinness book of records for having a voracious appetite for strawberries! And made the Farmers Weekly final in the ‘Farming Champion’ category. He writes: "A sustainable rural landscape that embraces food production, environmental rejuvenation and supports those that work in the countryside should be important to all of us. We’re heading into a period where our climate and politics are going to become increasingly volatile." View Phil's Agricology profile here to find out more about the farm at Allerton; their approach to soil health and use of direct drilling. The NIAB TAG guide 'Cover Crops' (providing guidance on selecting and managing cover crops according to your requirements), and the paper 'Impact of cover crops on yield and soils in the New Farming Systems programme'; evaluating how cover cropping systems can contribute to soil structural improvement, fertility enhancement and yield responses. The OSCAR Project's interactive 'Cover Crop and Living Mulch Wiki', spreading knowledge about legumes and non-leguminous species and machinery and practices. The Cotswold Seeds / Garden Organic publication 'Sort out your soil'; providing detailed, practical information on green manure crops.